Registration fees increase the closer you get to race date. REGISTER EARLY AND SAVE! Our fabulous post-race Pasta Party with beer, breakfast munchies, and live music! Licensed Sports Massage therapists will be on site to soothe your aching muscles for $12/10 minutes, $24/20 minutes, etc. Treat yourself! Early entrants who register by July 27, 2019 are eligible for refunds of entry fees or deferral to another upcoming race – athlete’s choice. 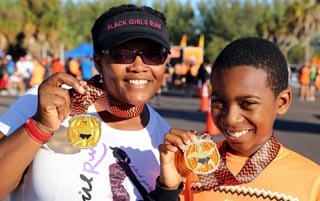 To receive a refund, transfer or credit, you must register by July 28, 2019 for the Florida Halloween Halfathon & 5K Race and notify the race director by e-mail (not Facebook) at least 3 weeks before the race or by October 6, 2019. This date is when we order your personalized bib and start preparing your packet. There are no refunds due to cancellations due to an Act of God, such as weather. No deferral or transfer is available if you do not show up for the race. All refunds will be issued after the last race of the series, the Shamrock Halfathon & 5K, on or about April 1, 2018. THERE ARE NO TRANSFERS OF BIBS TO OTHER ATHLETES. Non-registered runners will NOT be covered by USATF insurance and will be disqualified if caught. All our races are sanctioned and insured through USATF for runners, joggers, and walkers ONLY. Baby strollers, skaters, skateboards and bicycles are NOT allowed on the course during our races. Canadians may register online or by printing the entry form above, with check payable in U.S. Dollars. All other international participants MUST register online after using a major credit card. International participants requiring invitations to secure visas must request letter by September 1. You must include in your request your full mailing address as well as the address of the U.S. Consulate in your area. Letters of invitation will be sent by mail only.